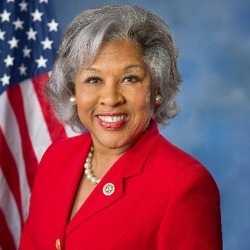 Since 2013, Congresswoman Joyce Beatty has represented Ohio’s Third Congressional District in the U.S. House of Representatives. She serves on the prestigious and exclusive House Financial Services Committee and is an influential member of the Democratic Women’s Working Group. In addition, Congresswoman Beatty is a regional whip, a member of the Congressional Black Caucus, Democratic Seniors Task Force, Co-Chair of the Financial and Economic Literacy Caucus and Congressional Heart and Stroke Coalition, Deputy Vice-Chair of the Congressional Voting Rights Caucus, and founder and co-chair of the Congressional Civility and Respect Caucus. Outside of her committee and numerous caucus memberships, Beatty is a committed and vocal supporter of early education, women’s equality, and the Office of Minority and Women Inclusion (OMWI), which seeks to increase the participation of women and minorities in all facets of the financial marketplace, among many other priorities.